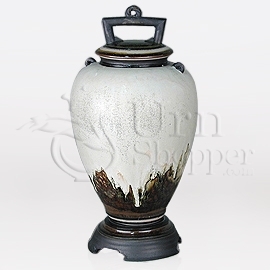 The Lava porcelain cremation urn is crafted in the shape of a classic style vase. Since this urn has been painstakingly crafted down to the last intricate detail, it is intended to be kept at home. However, this urn can also be entombed in an oversized cemetery columbarium niche or buried in an earth grave. Please note that some cemetery regulations may require the use of an urn vault prior to earth burial, but due to the large size of this urn, a standard-sized urn vault cannot be used.